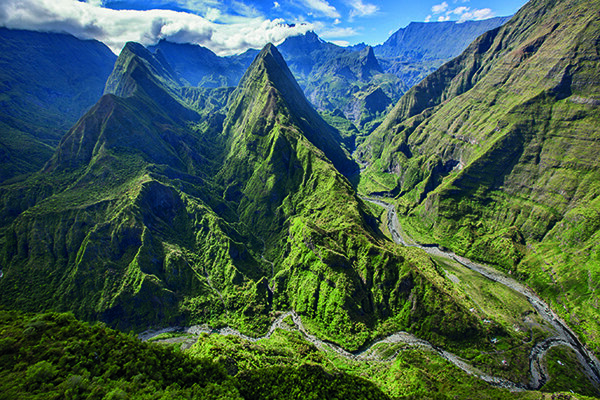 Ile de la Réunion is a postcard-pretty holiday island, with an unexpected secret: it hosts one of the toughest trail runs in the world. Dave Buchanan separates the resort from the running reality. After breezing through customs and immigration – without the fatigue and irritation usually associated with international travel; after all, it’s only a four-hour flight from Johannesburg (just head for Madagascar, then turn right) – I find my promised driver/guide is nowhere to be seen. So I approach the information desk. Outside the airport, at seven in the evening, 26-degree heat and 95% humidity are an invisible wall – uncomfortable at first, but you get used to it quickly. Inland, it’s a different story: you can drop 10 degrees – or 20 – in a half-hour car trip. Here’s why: the entire island’s about the size of greater Cape Town, 70-ish kilometres at its longest point, 30-something at its widest. But in that hankie-sized area are 12 peaks higher than 2 000 metres; the tallest tops out at just over 3 000. When a volcano builds an island, it’s violent and dramatic, and it goes straight up. 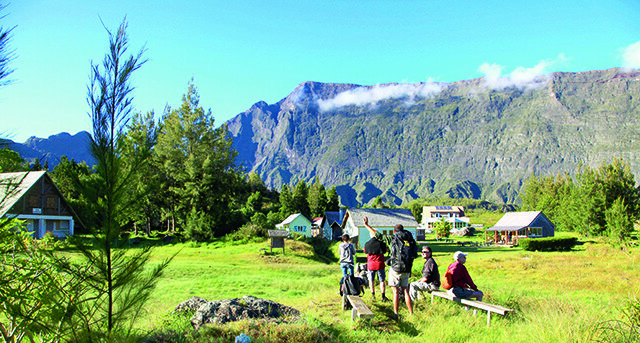 And that’s Réunion in a nutshell: in the space of a few kilometres you can go from beach to mountain top; humming, humid jungle to stark, harsh desert; Durban summer to Cape Town winter; peasant-farmer shacks to cookie-cutter European holiday houses to riotously-coloured Hindu temples. The 800 000 inhabitants reflect this eclectic mix. Some are French expats, but most are the descendants of colonial French landowners, West African slaves, Indian and Chinese indentured labourers, Portuguese sailors, you name it. 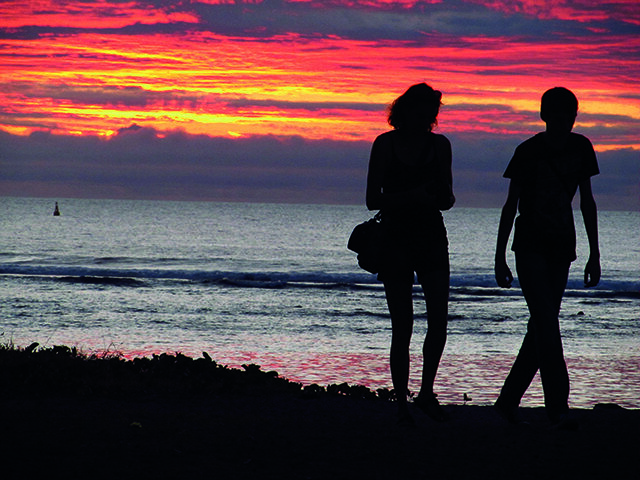 There’s an economic divide, related unemployment, class issues, Frenchmen-from-Réunion versus Frenchmen-from-France – all the usual; but for the most part, relative harmony, as far as I can tell. They’ve had more time than we have to get over their fractious colonial past. And to South African eyes, it seems paradisically safe. We start our flight gently enough, heading inland low and slow, putt-putting our way up the Maïdo (one of the peaks) like the slow bit at the start of a rollercoaster ride. Exactly like that, in fact; as we crest the lip, the ground falls away beneath us, shockingly fast – 1 500 metres, in the blink of an eye. Suddenly an endless valley stretches out ahead, a spidery thread of river barely visible at the bottom, tiny doll villages on miniature rock outcrops winking in the sunlight, wispy clouds floating by a thousand metres below us. Below us. Imagine running through this, I think. Yet people do. I’ve come to see them do it. It’s hard to grasp the sheer scale of what we’re seeing, our eyes aren’t used to taking in that much at once. It’s awe-inspiring. Humbling. This is the sort of thing that starts religions. But there’s no time for reflection; we plunge at a terrifying angle into the Cirque de Salazie, one of the island’s three extinct volcanoes. 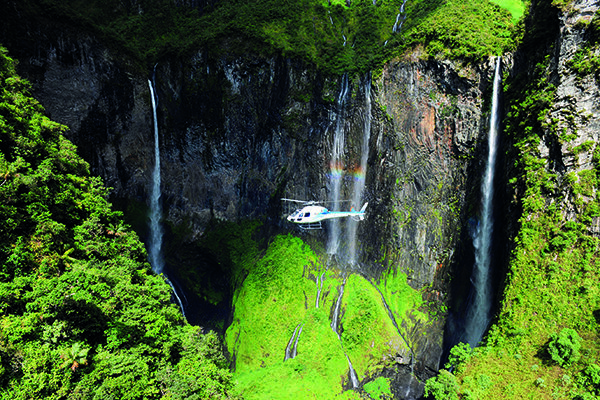 Jean-Sebastian shouts something incomprehensible over his shoulder; we grin and thumbs-up frantically to get him to face the same direction as the helicopter again, as the towering crater walls appear mere metres away from the whirling blades. But we did hear one word he said: Avatar. It’s appropriate. In seconds, our fear’s gone: there’s no room for it. Jaws dropping, we’re immersed in a 3-D world straight out of a science-fiction moviemaker’s imagination – impossibly steep, jagged walls, verdant with greenery, fairy-tale waterfalls tumbling hundreds of slo-mo metres, the flash of crimson wings at the edge of our vision; an unsettling, alien landscape, but special-effects beautiful. Right at that moment, I could go home and die happy. 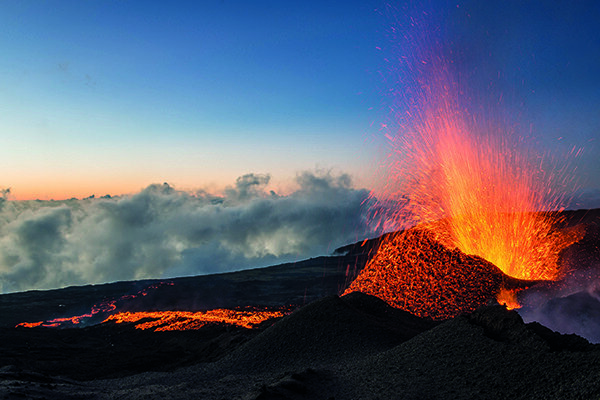 But there’s more: the ominous black-scorched crater of the Piton de la Fournaise (the island’s extremely active volcano – sadly, we’ve missed an eruption by two days); the desolate, unearthly red rock of the Plaine des Sables; the ruler-straight strip of turquoise lagoon that separates sharks from tourists. I’m speechless when we land, still dealing with sensory overload. The next day I’m brought back down to earth, reminded why I’m here: to follow a race. 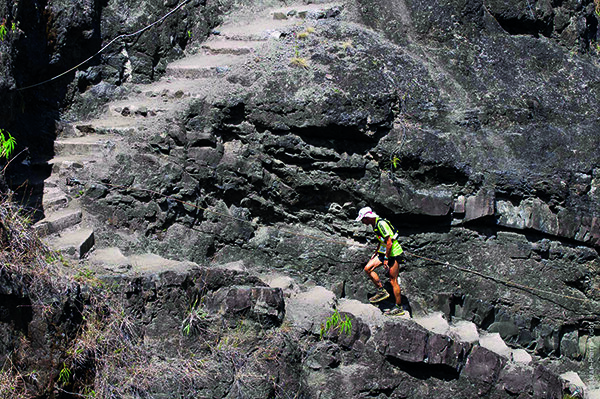 But not just any race; in a land of trail-running fanatics, the Grand Raid de la Réunion is the biggest sporting event of the year. At 164 kilometres of extreme terrain, with close on 10 000 metres of vertical elevation, La Diagonale des Fous (The Madman’s Diagonal) is respected and feared worldwide – and for good reason. A lot of the staggering landscape we saw from the helicopter is ground the Raiders will cover. Before the entrance criteria were introduced some years ago (it’s been going since 1993), several entrants died along the way. We’re off to Saint-Pierre, on the south-west coast, to see the start of the main race – at 10 o’clock at night. It may be late in the evening, but the stadium and surrounds of Saint-Pierre are buzzing. 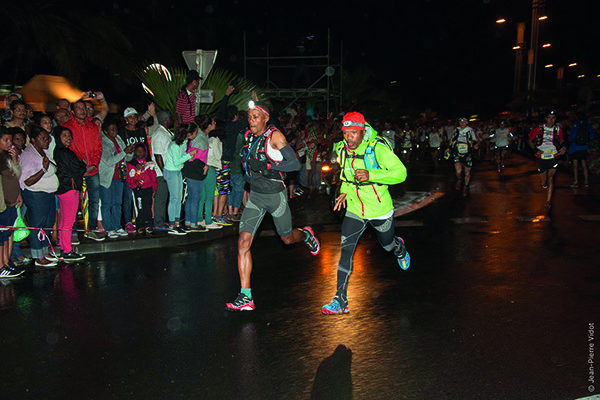 Because most entrants are Réunionnais (most others are from France), everyone’s come out in support – friends, extended family, children waving banners, it’s more a carnival than a race. Bands play and officials speechify, and not even the sprinkling of rain that showers the crowd can dampen the sense of repressed excitement. The runners themselves – 2 600 of them – are quiet, focused inwards; fingers drum on hydration packs and shoelaces are tied and re-tied obsessively, only the odd nervous laugh betraying their collective tension. Then the countdown begins, and the spectators take up the chant; the starter’s gun fires, and all hell breaks loose – the crowd roars along with the motorbikes and quadbikes leading the pack, camera flashes machine-gun the night, and family members press forward to brush their loved ones’ fingers one last time as they sweep past. Who knows how many will stagger over the finish line in Saint-Denis, the capital, on the opposite side of the island. At lunchtime the next day, after a morning of indulgence near Saint-Gilles (golden sand, lukewarm lagoon, while thousands plod their weary way through the mountains), we hit the road once more – down the coast almost to Saint-Louis, then inland again, and up-up-up to the isolated town of Cilaos: one of the major checkpoints for the Diagonale. Every road inland is essentially vertical, and has more hairpin bends and switchbacks than you can count; plus tunnels bored straight through the mountains, lunatics on bicycles (with record-breaking calves, I suspect), and – I’m astounded to see – even buses. I raise my eyebrows at Philippe-the-guide, and he confirms I’m not hallucinating. “Buses go anywhere,” he says offhandedly. Good news for Saffers on a budget. Getting around by bus takes a little time and planning, but the routes cover a lot of the island, going almost everywhere that cars do on the (mostly) European-standard roads. And they’re fairly reliable; hey, if you want your bus exactly on time, go to Switzerland. Cilaos itself is a pretty town, bigger than you might expect given that the road to get there was built only 60-odd years ago. Its remote location is deliberate; it was founded by escaped slaves, who knew their erstwhile masters couldn’t be bothered to trek that far into the mountains to get them back. At 1 200 metres elevation it’s cool but pleasant, which must be a relief to the runners now trundling slowly into town, 16 hours into their race. It’s 10pm, and we’re back in Saint-Denis to see the winner of the Diagonale cross the line, 24 hours after he started. The rest of the field will take another two days to arrive – those who make it. Nine hundred will not. The circus from the starting line in Saint-Pierre has been transported to the capital city’s Ville Sportive (Sports City) stadium, and has grown even larger. There are carnival rides for the children, food stalls, a climbing wall, big-screen TVs, brass bands and dancing girls. 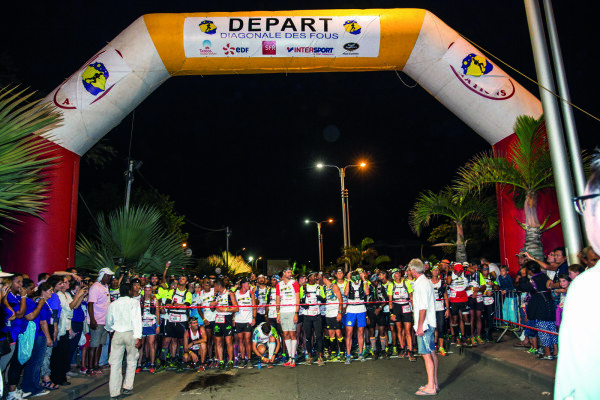 A pop-up Grand Raid radio station broadcasts for just these three days in the year, and its commentator reports from the start of the race until the winner gets in, 24 hours without a significant break. There’s even a Grand Raid board game on sale – did I mention this is a big event around here? The crowd is boisterous, too; usually the race is dominated by Frenchmen-from-France, but this year Freddy Thevenin, one of Réunion’s own, is making a determined bid for victory. But it’s not to be: despite a broken finger from a fall, 45-year-old Antoine Guillon of France takes first place, in 24:17.40. It’s his ninth Grand Raid, and his first win. Thevenin comes in third, an hour later. Both are greeted as heroes. The next day I witness something that, in a way, is even more emotional than last night’s winner breaking the tape. We’re back near the top of the Maïdo – arriving by car rather than helicopter this time, and fighting our way past many others to find a parking spot. The previous Grand Raid checkpoint is a little village, way down in the valley below; invisible to us, thanks to drifting cloud. From there, runners must toil 1 400 vertical metres up a skyscraper-steep slope, emerging from the mist at the highest point they will reach today. Which is where we’re standing, along with a crowd: the families of the runners. As each one appears, a shout goes up from his or her relatives, and eager hands remove hydration packs and offer food and massages. 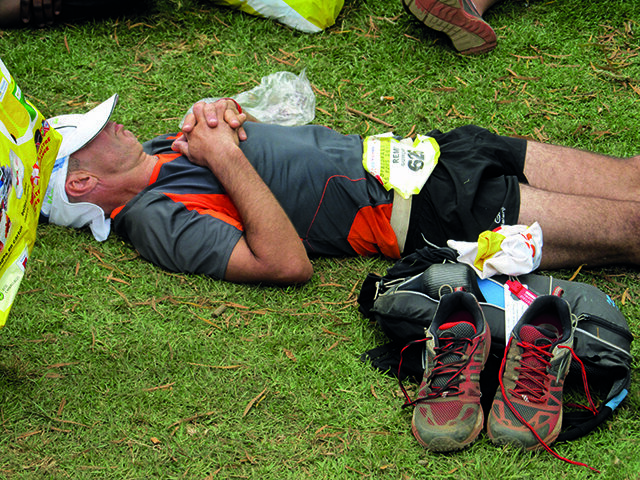 There are tears.Some runners are ashen-faced and must be be supported to a rest spot; a surprising number manage a smile, looking drained but determined. One even does a little jig as he reaches the top, though I see him horizontal and snoring on a patch of grass a few minutes later. And every one of them knows the winner has been home and resting for 15 hours already. Yet still they press on. Sunday dawns cool and clear; dolphins cavort off the coast of Saint-Denis, and after 64 hours and deafened by celebratory fireworks, still the runners trickle in – all the distances mixed now, but everyone looks much the same: exhausted, muddy, scratched and scarred, but triumphant. It’s no small thing to finish this event. Besides their medals, these trail heroes have something else to cherish: the knowledge that they have done more than they ever thought possible, that they’ve been tested to the limit and not been found wanting. No small thing. Air Austral (air-austral.com; click on the Union Jack for English) flies Saint-Denis to Jhb and back on Sundays and Thursdays (and their in-flight meals rock); other options available through Air Mauritius. I stayed at the 3-star Ermitage Boutik Hotel in Ermitage les Bains, west coast; from about €100 (R1500), though hotel rooms, guesthouses, B&Bs etc can be had from around R600. A few youth hostels and hiking huts available. AirBnB.com also has a presence. Car Jaune (Yellow Bus) routes cover a lot of the island; many districts also have their own bus services. Taxis from the airport are expensive. Tuk-tuks available in some areas. Car hire is reasonable (remember to drive on the right!). Some good cycle lanes on the coastal roads; you’ll need strong legs if you head inland. Roaming is available, but it’s cheaper to buy a pay-as-you-go SIM from Orange or SRR. Coverage is generally good, but patchy in the mountains. WiFi (pronounced ‘weefee’!) is fairly common. French-inspired with Oriental/Asian influences, quality ingredients, baguettes to die for. Markets, supermarkets & local-food takeaways are good value; sit-down restaurants less so. Decent local beer – it’s called Bourbon, but ask for a Dodo (pictured on the bottle, and all over Reunion; it even has its own Instagram account). 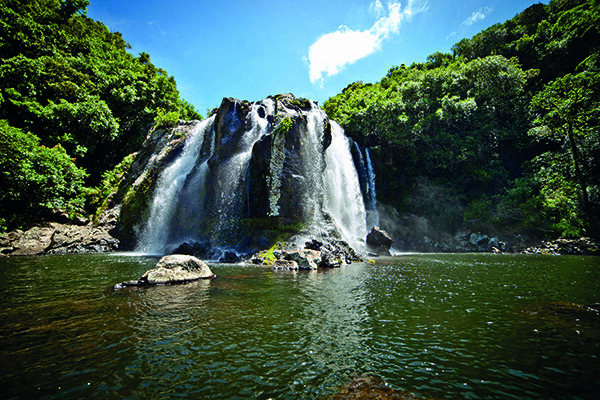 Forests and hiking, east side; mountains and volcanoes, central; beach and lagoon, west. 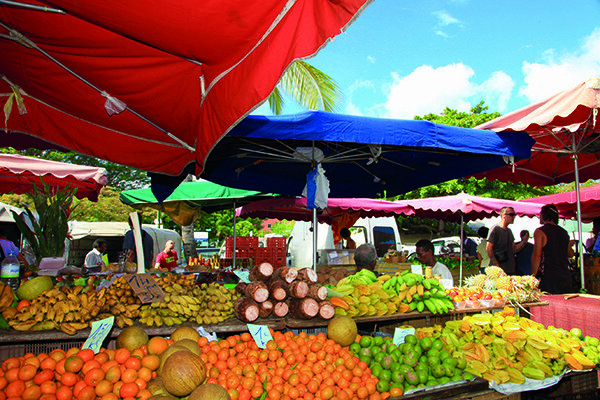 Cultural, Saint-Denis and Saint-Pierre. But all areas are worth visiting, and it’s a small island – you can drive all the way around in five and a half hours. South Africans do not require visas. The currency is the Euro; be warned. Few speak English well, but you’ll get by. Helicopter flights over the island are expensive but worth it (try helilagon.com); so are good guides (mine was excellent: Philippe Techer, 0262 (0)692 953 703, philtecher2@gmail.com). More info at en.reunion.fr & welcome toreunionisland.com.